(It is a public holiday in the UK today - back with more procurement insight and news tomorrow). At 1pm yesterday, one of my favourite rock bands, The Joy Formidable, who have been low-profile for a few years made their big return, to the Main Stage at Reading Festival, no less. In front of them – well, maybe 150 people? Enthusiastic, but restricted somewhat in their responses by the layers of wet weather gear we were all wearing… it is the first time I have literally just walked up to the front barrier, right in the middle of the stage, while a band was playing (see the picture above). I felt sorry for the band, but they’re playing Canada and US arenas with the Foo Fighters soon so that will be a bit of a contrast in audience size! Goodness, it rained. We saw many kids off home even as we arrived at noon, not surprisingly really. There must have been a few cases of hypothermia – waterproof overtrousers now get added to the “essentials” list for Reading. However, in the end we had an excellent day. The rain stopped around 6pm, and I didn’t do quite as much moving between tents and stages as usual, but the music was perhaps the best (for me anyway) of the three days. A theme in the Festival Republic tent was British male singer-songwriters, with Isaac Gracie, Tom Grennan, Lewis Capaldi, and Sam Fender. They were all clearly very talented, quite different, I enjoyed them all, and all should have successful careers. Gracie is a natural introvert but is becoming more confident, and got pretty rowdy with his band, although there were some lovely emotional moments too. Fender is from Newcastle but can sound quite retro, with an almost US West Coast feel at times (late Eagles maybe) to his socially conscious songwriting. Capaldi has a huge, classic rock voice and a lovely self-depreciating sense of humour – “if you don’t like chubby Scotsman singing f****g depressing songs, you better go now” he told us early on! The songs are generally about his bad romantic experiences but a number already sound like classics (and are huge on streaming, so he may be the biggest of these artists eventually). Grennan is more bluesy and again writes strong pop-rock songs. But an older British singer-songwriter was one of the pleasant surprises of the day. Get Cape. Wear Cape. Fly (real name Sam Duckworth) has been quiet for the last four years or so. He often used to perform on his own, but yesterday he turned up with an excellent ten-piece band – horns, strings, the lot. And his songs sounded great with the wide-screen treatment; a British Springsteen in the making maybe? He is only 32, even though he has been around the industry for years. I saw a bit more of the headliners, Kings of Leon, than I did of Kendrick Lamar the previous night, but still only about half an hour of their set. They seemed … fine. I like their earlier work in particular, but I’m not convinced they are a festival headline band. However, I could be wrong – they drew a big crowd and certainly got some sing-alongs going. I was very excited about Let’s Eat Grandma, loving both their albums. While I very much enjoyed the set, it was received politely rather than rapturously, and the two young woman who are LEG need to think about their choice of songs and the set scheduling, I would humbly suggest. When you only have 30 minutes, finishing with Donnie Darko doesn’t work. It is brilliant on the album, but at 11 minutes, including 2 minutes of just backing track while the girls sat on the floor, is perhaps not the best way of driving audience emotion and engagement. If LEG was a marginal disappointment given high expectations, young US band Hippo Campus lived up to my hopes. I just love this band, even if I don’t fully understand why songs like South so engage me emotionally. They make performing look effortless, even with pretty complex arrangements and harmonies, and got a great reception from an almost-full tent. A mention too for strong sets too from Spector (good to see them back), Marsicans (a bigger sound then when we last saw them, Maccabees fans should check them out) and Coin (intelligent, tuneful US indie). Some of the bigger UK rock bands enjoyed themselves and got good crowd reactions - the Vaccines (who seemed to be having an absolute ball on the main stage), Don Broco and Slaves in particular. 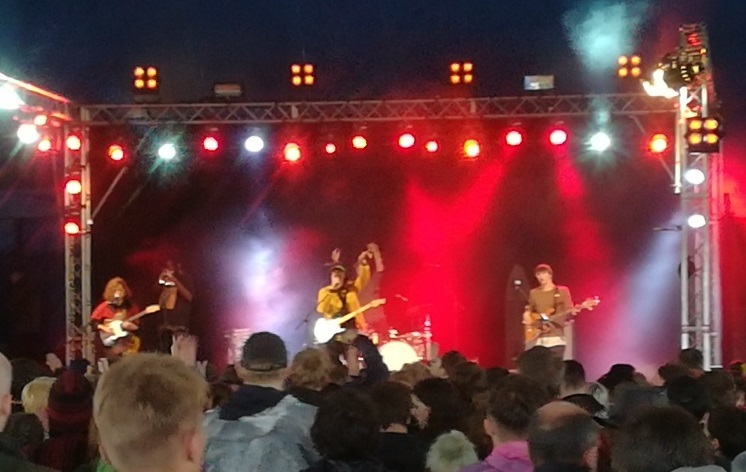 I first saw Slaves with about 50 other folk on the BBC Introducing stage at Reading in 2013 and in my review then said this – “Absolutely brilliant! And the hilarious “Girl fight” is undoubtedly my song so far of the Festival”. However, I never expected them to pack 15,000 people into the Radio 1 tent and virtually top the bill 5 years later! That’s one of the wonderful things about the Festival, spotting the future stars. So who might make the same leap in the next five years? Well, we didn’t spend much time at the (outdoor) BBC Introducing stage yesterday but despite the rain we did very much enjoy Only the Poets, a local Reading indie band. Perhaps they will have that trajectory too … but in any case, we’ll be back next year to find out, health permitting. Peter Smith. Excellent review. Thanks for spreading the word on Welshly Arms. You can hear the band on oWOWnow.com online radio Cleveland, Ohio USA. Their back catalogue is impressive as well. Love the Paul Rodgers comparison to Sam Getz.